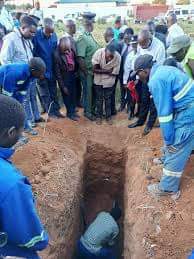 The DNA test results of a 19-year-old girl of Ndola’s Masala Township who is alleged to have risen from the dead have confirmed that she is not the deceased daughter of the Lufunja family, according to Police on the Copperbelt. And Provincial police commissioner Charity Katanga has strongly rebuked the two “prophets” at the center of the resurrection saga. Briefing the press on the outcome of the DNA tests yesterday, Katanga revealed that the results indicate that the girl in question is not the late Winnie Lufunja. She said the results have also confirmed that the girl belongs to the family of second claimant Ms. Irene Gondwe. The girl is currently under police care but will be handed back to her family today. Why should she rise from the dead it doesnt make any sense who has anything to gain from this .